Alzheimer’s disease (AD) and Parkinson’s disease (PD) are progressive neurodegenerative diseases of ageing. The common denominator in these diseases is the presence of aggregated proteins in the brain, which ultimately leads to neuronal dysfunction and death. An emerging theory is that the progressive nature of many neurodegenerative diseases, including AD and PD, stems from the formation and subsequent spread of self-propagating protein aggregates throughout the brain. This occurs when misfolded, aggregated proteins attain the ability to template the misfolding of their properly folded counterparts, enabling “propagation” of the misfolded form. This self-propagation and cellular spreading phenomenon is reminiscent of the prion diseases such as Creutzfeldt-Jakob Disease (CJD) in which the prion protein undergoes a conformational rearrangement into an infectious, self-propagating isoform. While the original definition of a prion was limited to the infectious protein pathogens that cause CJD and related diseases, it has been expanded with time to include all self-propagating protein conformations. In PD and related synucleinopathies such as multiple system atrophy (MSA), the self-propagating protein aggregates are composed of α-synuclein protein (“α-synuclein prions”). Two prions are associated with AD pathology: self-propagating aggregates of both the beta-amyloid (Aβ) peptide (“Aβ prions”) and the tau protein (“tau prions”) have been described. Since there is no evidence that AD or PD can be transmitted between humans (and are therefore not “infectious” in the same sense as the prion diseases ), some investigators prefer to use other terms for these self-propagating misfolded proteins, including “prion-like protein aggregates”, “prionoids”, and “proteopathic seeds”. The evidence that Aβ and α-synuclein aggregates become self-propagating during disease is mounting. In particular, intracerebral injection of susceptible transgenic mice with aggregated α-synuclein protein accelerates disease and induces the deposition of α-synuclein in the brain [Mougenot 2012; Luk 2012; Watts 2013]. Similarly, inoculation of susceptible transgenic mice with aggregated Aβ peptide induces the formation of amyloid plaques similar to those found in the brains of AD patients [Meyer-Luehmann 2006; Eisele 2010; Morales 2012]. We have recently demonstrated that Aβ fibrils purified from the brains of transgenic mice as well as Aβ aggregates composed exclusively of synthetic Aβ are sufficient to induce Aβ deposition in transgenic mice [Stöhr 2012]. The formation of self-propagating protein aggregates likely constitutes one of the earliest events in neurodegenerative diseases. Thus, targeting their production may constitute a powerful therapeutic strategy for halting the progression of AD, PD, and related illnesses. Moreover, the identification and characterization of such species may lead to improved diagnostic tests capable of detecting disease-related changes in the brain at the earliest possible time points. 1. Are different “strains” of Aβ or α-synuclein aggregates responsible for the diverse clinical and pathological presentations of disease in humans? 2. What is the biochemical nature of the specific Aβ and α-synuclein assemblies that mediate spreading of protein aggregation during disease? 3. 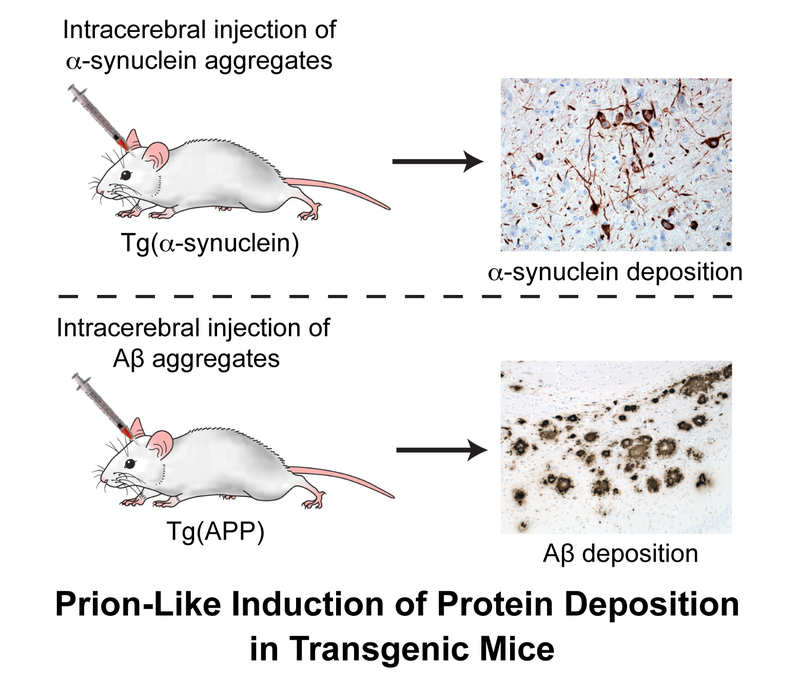 Can we take advantage of the prion-like behaviour of Aβ and α-synuclein aggregates in order to develop superior, more translational mouse models of human neurodegenerative diseases?